I'm genuinely surprised it's taken me this long to talk about Young Fathers at all. It's not like I wasn't aware the group existed, but they always seemed a little adjacent to the music that's normally on my radar, so this review was going to be a learning experience for me. So okay, Young Fathers: a trio from Scotland that started on the indie label Anticon with a particularly off-kilter brand of hip-hop to which I couldn't really trace a clear sonic lineage. The melodies were cavernous and droning, the beats were blocky but still carried an impressive amount of groove, and the two MCs presented a brand of unsettled melancholy that used blunt but heavy language to convey increasingly bleak ideas, along with harmonies that were surprisingly stirring. I'm not really certain it was my thing - I do think the songwriting took a dip for the full-length debut Dead along with a weird synth-rock pivot with a smattering of alternative R&B, but it was compelling in a curious way, not quite with the level of propulsive power I'd see in a group like Algiers or Injury Reserve or Death Grips, but I got the appeal. But then they shifted again towards a lo-fi, indie pop rock sound a year later for a record with the loaded title White Men Are Black Men Too, and... honestly, while I think it's a solid enough record, I think I might like it more for some of the ideas the trio was trying to explore conceptually than the sound itself, as the pop or rock-leaning elements could feel a tad hit-or-miss against their production style. But hey, who knows what direction they could be taking with this project, now on the Ninja Tune label proper, so what did we get on Cocoa Sugar? So here's the thing: I feel like my mantra when it comes to all Young Fathers records got all the more clear with every listen I gave to Cocoa Sugar - and believe me, there were a lot of listens. And it's not that this project is bad - I won't deny that this project is one of their most diverse, colourful, and brimming with potent ideas, and for the audience who can get into their material, this'll definitely win them over. And I absolutely get why this group has received so much critical acclaim for this... and yet after well over a dozen listens, I'm just forced to admit that while I appreciate what this trio is doing, it just doesn't resonate more deeply for me, a project I admire more than I actually like or enjoy it. And you know, if it was one distinct thing that kept away from fully embracing Young Fathers, that'd be one thing, but the more listens I gave this project the more I'd argue it's the little things... so let's start with the songwriting. Now discerning a theme on any project by this trio can be tough to parse, but on the most abstract level it comes from the lingering gap between physical satisfaction and spiritual fulfillment, however that can be found. And this can take very different forms, from the obliquely referenced giant on 'Fee Fi' that could span society to a god the group clearly doesn't believe in, to the white artists in their space of indie music on 'Turn' that Young Fathers doesn't deride for their talent and hard work, but is clear that they don't want to be boxed in or isolated. And when confronting systems that would do this, they seem keenly aware of their fragility on tracks like on 'Lord' and 'Holy Ghost', mostly through a sardonic recontextualization of religious iconography to lend their material power while sneering at their barriers they try to erect - not the first time this record reminded me a little of Algiers, and in a good way. But where this record truly gets intriguing is in that give-and-take found in a deeper love on songs like 'In My View' and 'Tremolo' and 'Wow', highlighting the search for an equal that can echo themselves, but also aware that with an elevated view of one's self they tend to aim higher to satiate their ego. It's also a reason why 'Border Girl' stood out to me, flirting with androgyny and blurred gender norms in a way that felt both natural and earnest in a great way. 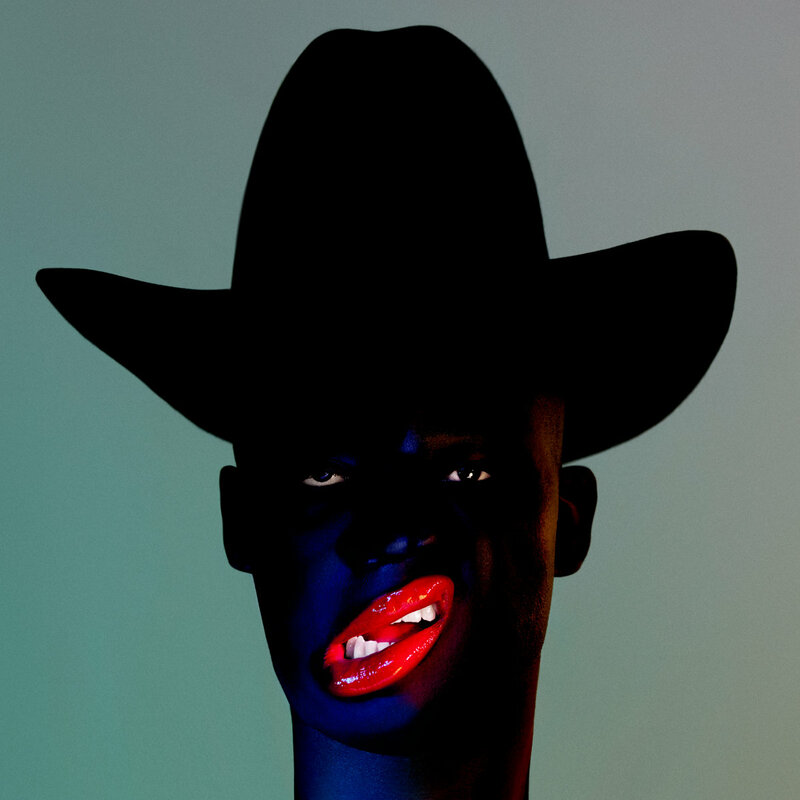 But ultimately it doesn't seem like Young Fathers find much of an answer, and by the closing track 'Picking You' the sentiment is less of transcendence - of which again they don't believe - and more that it's the 'closest thing to heaven maybe'. Still self-serving in an odd way, sure, and definitely not reflective of a sustainable love, but given this album's oddly static progression, it's really the only conclusion that fits. Now granted I could be missing the mark with all of this: Young Fathers have always structured their half-sung, half-murmured, half-rapped lyrics in a way to intentionally feel oblique and open to interpretation, and by infusing a load of biblical iconography at least half-ironically they definitely aren't making it easier... but that actually does tie into one big issue I have with this album: progression. I'm all in favour of circular themes, where the record eventually arrives back at its start having picked up wisdom along the way, but the trio is coming in with the same sense of balanced and nuanced framing that has characterized much of their previous work, and they sound as frustrated as I feel by the end of the record, even if they are very accepting of ambiguity in themselves - hell, it's what lets them justify the deeply held humility of 'Lord' and 'In My View' against the darker touches of 'Wire' and 'Wow' and especially 'Toy'. But it's hard not to feel like the record is stuck in a lane a half-step away from really cutting loose across the board, taking those vocals sung or spat into more strident swells, taking the pulsating gallops of groove from thrumming low-end dub, touches of gospel, and melodies just looking for an excuse to burst forth to really explode. Don't get me wrong, there are crescendos on this project against the cavernous mix and ragged, lo-fi pickups, adding layers to 'In My View' and 'Turn' and 'Wow' to really burst forth... and yet it doesn't happen, and the increasingly short song lengths often leave me feeling like we have really damn potent fragments that could be refined with more structure, all the more emphasized by how Young Fathers intentionally bring in more conventional foundations to these tunes. Now granted, that structure often pays some considerable dividends: the more soulful hook of 'In My View', the major key popping swell of 'Tremolo', the larger choral vocals playing against the clipped, wiry synthline of 'Border Girl', the really damn potent shuddering groove of 'Holy Ghost'... but the tonal choice in vocals or synths don't always work, from the nasal touches on 'Holy Ghost' to the grimy shrill vocal filters on 'Turn' and 'Wire', elements that just get distracting from songs that really could have been great. But again, for as much as this record didn't come together for me I'm almost certain Cocoa Sugar will satisfy any listener who is on-board for this lo-fi dub-soul fusion Young Fathers are working here, scattering traces of hip-hop, synthpop, and gospel around the way. And again, there are a lot of potent, well-framed ideas and pathos that runs through this record... but it never gets all the way there to really resonate beyond that, and when you couple it with production and synth choices that split the difference between earthy, ramshackle potency and jittery shrill blockiness, I'm left wishing I could like this a fair bit more. For me, it's a very strong 6/10 and definitely recommended, just not quite for me, and I can accept that. And hell, like with any Young Fathers record you're not going to hear anything like it this year, so yeah, it's worth the curiosity, check it out.